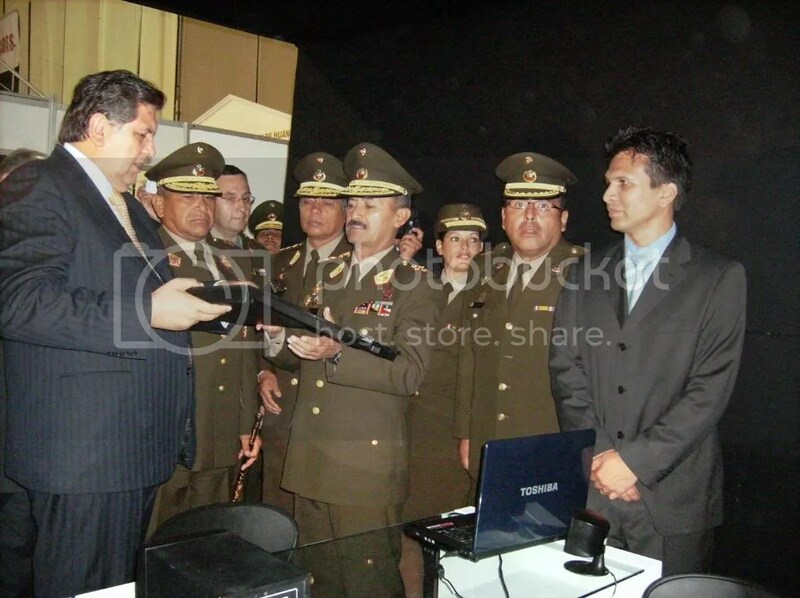 After a year of continous work of the CICTE (Peruvian Army) to develop a new MI-17 helicopter simulator, in the SITDEF the beta release for the solution was properly showed. ICTEC, my company, as software consultor for the DIDETEC/CICTE, suggest -obviously- FLOSS solutions to make the develop times faster and in this case, the core of the new peruvian simulator is a FlightGear based application. Many months of training in Blender, Python/GTK/Glade, Databases, etc. 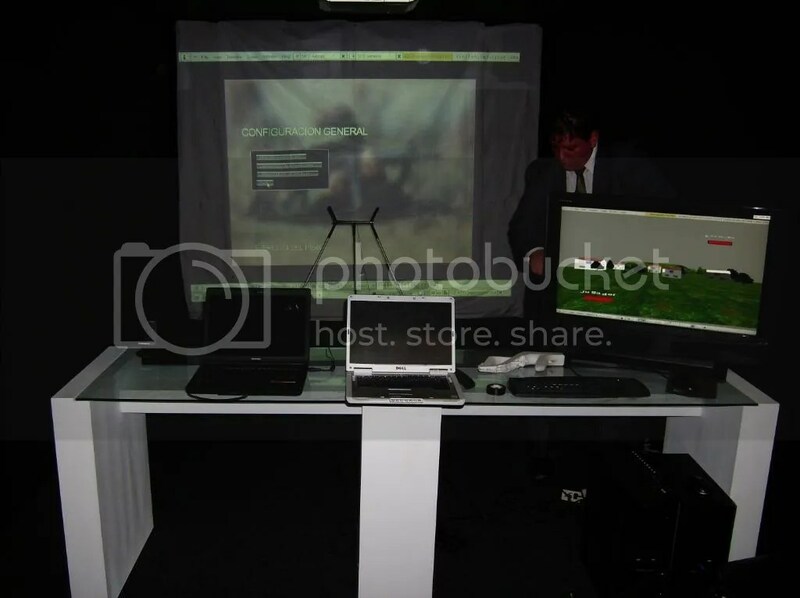 allows to the people of the CICTE build now a really good and cheap option (the budget was about US$ 600k, meanwhile the market offers at least US$ 3.5M simulators). Peru is making our own technology pieces and FLOSS based (wait for more technical news). This week is very excited for all members of ICTEC, after some months of continous work, we launch the first alpha release for an Army Shooting Simulator made completely in BGE and -of course- merged with a lot of python. Previously, we use Blender for build objects in a real geo-referenced world for the MI17 simulator, but now all the work was made enterily for BGE andall the new features provided since the launch of 2.48 version. SITDEF 2009 (II International Defense Technology Exhibition and Prevention of Natural Disaster), who taste the FLOSS flavor. Finally, i have finished the tutorial for install the scenery creation tools (terragear-cs) for flightgear inside Ubuntu. The work was painful because the order of steps and lack of documentation but finally we got it. Soon we will add a usage procedure with some tips, check the tutorial. The security is basic and for people that wish to add more privacy on their data, this post will be a great option. As reference, i can say that this can be a good practive to protect us or just for fun!!! 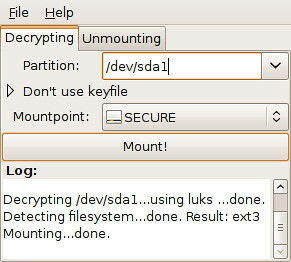 Some months ago, i read one article from ubuntu tutorials about howto encrypt a partition in 7 steps. Well that guide is -for me- the best that i found and explains shortly howto “hide” to anyone our information. My recommendation for all the people that wants follow the tutorial is advance whitout any doubt to the Step 7; however, i will add some modifications trying to offer a simple howto mount the encrypted-generated partition. The addition of the partition (encrypted) means that every time that you want to mount the drive must input the proper password each time at boot time; well, avoid this mounting the partition only when you need using gdecrypt, a nice python app that makes our work more simple. Just install and use, you can locate the link for access to this tool in the Applications/System Tools Menu. Open it, locate the encrypted partition in the combo box, choose the mounting point, press “mount”, input the password and done…… The partition is ready for use in your desktop. Some times the people needs to put clear their ideas and -also- with a properly order. In this case, i will show us to vym (view your mind), this tool do exactly as we say: you have to think and translate your ideas in a virtual page, using a simple tools, building intuitivily a group of concepts for obtain a main porpouse: a planning guide. The major feature -for me- is the option for export the conceptual map to taskjuggler (a very good project planning application for Linux), which allows me use for any project in my company, but also with my costumers who have seen the benefits of this tool (business planning then….). Next, you’ll see a graphic, exported from vym and show us the planning for a new project: Smart Control Panel (scp) which goal is to be a really simple and powerful application for *nix administrators. Don’t wait for try this great tool. Bueno, comenzamos este nuevo espacio NewFFTek con buenas intenciones y compromisos….. en breve publicaré algunos artículos técnicos interesantes, como por ejemplo: hacks para mandos de wii (wiimote), sistemas de control de versiones con bazaar, como implementar un cluster mpich2, procesamiento paralelizado y distribuido empleando GPUs (más de 1000 procesadores en simultaneo!!! ), simulación de escenarios, blender, programación con python y erlang…. Ah!!! me olvidé: este blog será en inglés únicamente, mis posts en castellano sólo estarán disponibles en Spleen at… (Blogger in spanish). This blog will be in english… thanks in advance. Today i was in a meeting with some students/workers who needs to program an application for control devices through a serial port, well in this moment i will not take about this task, if not about the need of send many independent signals. In fact, currently the application (with a curses module) only controls a single device, but we need operates “n” ports and “n” boards, who we can that?. Simple: threads. Obviously, copy the code and paste on a new file, by example: thread_demo.py, run it. The result show us in a same time many tasks, try to apply this concept to any application which needs include parallel works. In the further articles i will to try to focus in some complex python areas, obviously, i will not forget the serial port control (or parallel, USB, etc. if you wish).